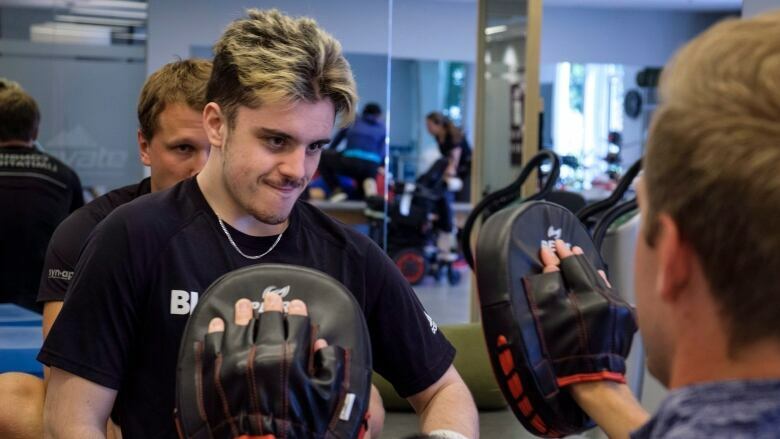 The 19-year-old's two-hour routine at Synaptic: Spinal Cord Injury and Neuro Rehabilitation Centre in Calgary included chin-ups, boxing, heavy rope training and pulling himself into a full standing position from his wheelchair just with the use of his arms. "It's a lot more vigorous here," said Straschnitzki, who was discharged from the Shriners Hospital in Philadelphia earlier this month. "It was pretty intimidating. But once I did it, I said let's keep doing this and work on it." "This is going to make Philadelphia seem like a vacation," said Synaptic's executive director and founder Uyen Nguyen, who worked as a sports therapist for elite athletes before opening the clinic in 2012. "His body has recovered a little bit more so he's able to tolerate more." "I realized I've got some movement back in my core muscles. They're pretty weak but they're getting back so I'm pretty excited," he said. "They should come back stronger and who knows what will happen after." Nguyen said Straschnitzki is now able to flex some of his stomach muscles and it's a good sign. "Our assessment shows he has some voluntary control below his level of injury so he's able to contract some of the abdominal muscles on command. So it's voluntary. We'll work on that six pack," she said. "We don't have a discharge date. We don't have this checklist of you've met all these things and goodbye, good luck. What we find in here is most people's goals evolve over time," she said. "We're constantly pushing to see where the limitations are. We don't know what he's capable of so, until you try, you don't know and it's really a discovery process." Tom Straschnitzki says his son has made "big time" progress since he began his therapy at Foothills Medical Centre in Calgary three months ago. "He's getting his balance, but that's also from the training from Philly and the occupational therapists in Foothills also. It's kind of progressed to where he is now. Now they're just taking it over and doing it extra hard," he said. Straschnitzki's dream of returning to the ice came true late last week. He was able to try out the sport which is one of the most popular events at the Winter Paralympic Games. "First time on ice since April 5," Tom Straschnitzki posted on Twitter. "BIGGEST SMILE momma and I have ever seen."